GUNMEN have opened fire and detonated suicide vests inside Iran's parliament building and the mausoleum of Ayatollah Khomeini. The attacks are ongoing. Early reports from Iranian media are conflicting, but seven people are so far believed killed in the parliament attack alone. Iran's Health Ministry reports 35 injured have been taken to Tehran hospitals. Iran's Tasnim news agency reports four hostages have been taken in parliament house and the standoff continues, with special forces having entered the building. It is understood one of the attackers detonated a suicide vest as special forces approached. Attackers at the mausoleum to Tehran's south appear to have targeted pilgrims, with one detonating a bomb while others opened fire. Islamic State has claimed responsibility for the attacks. Tehran has been rocked by twin attacks. The Fars news agency reports assailants shoot their way into the parliament building, killing two guards and wounding 10 civilians. While reports remain mixed, most witnesses place the number of assailants at four. The Tasnim news agency quotes Parliament's National Security and Foreign Policy Commission member Hossein Naqavi Hosseini as saying gunfire continues. It quotes parliamentary sources as saying there are seven dead within parliament, with the hostages being detained on the top floors. Unconfirmed reports suggest one of the attackers has now detonated a suicide vest as special forces entered the fourth floor. Fars states one assailant was detained as he attempted to flee the building. It quotes a senior member of the parliament's Presiding Board, Akbar Ranjbarzadeh, as saying the assailant was arrested at the parliament's hallway. It also cites senior MP Elyas Hazrati as saying three assailants attacked the parliament, carrying two Kalashnikov rifles and a handgun. One of the deputies (representatives) has also told Fars that the remaining assailants have been trapped in the offices of the deputies. "Clashes still continue at the parliament building," he said. Reporters outside the parliament said that the guards are dispersing people but the sound of shooting is still heard from inside the parliament's building, Fars reports, which remains in a state of lockdown. Photos and video reports show people - including children - attempting to escape via the building's windows. Unconfirmed reports state attackers are taking shots at police, bystanders and media outside. Witnesses said the attackers were shooting from the fourth floor of the parliament building down at people in the streets below. "I was passing by one of the streets. I thought that children were playing with fireworks, but I realised people are hiding and lying down on the streets," Ebrahim Ghanimi, who was around the parliament building when the assailants stormed in, told The Associated Press. The semi-official ISNA news agency said all entrance and exit gates at parliament were closed and that lawmakers and reporters were ordered to remain in place inside the chamber. State TV reported four attackers are involved in the parliament attack, and said eight people were wounded. A second, simultaneous attack was made one of Iran's cultural icons, the mausoleum of founder Ayatollah Khomeini. Initial reports suggest one was a female suicide bomber. Fars news agency states there were about four attackers at the shrine, with three shooting into the crowd of pilgrims gathered there as the third blew herself up outside a police facility. Tasnim news agency reports the terrorists stormed the mausoleum through its wetern gate. Early casualty reports remain confused, though Tasnim states the count is currently one attendant killed and four visitors injured. Unconfirmed reports state one of the remaining two attackers suicided and a third - another woman - has been arrested. However, Tasnim reports exchanges of gunfire are still being heard and that at least one of the attackers has been cornered. 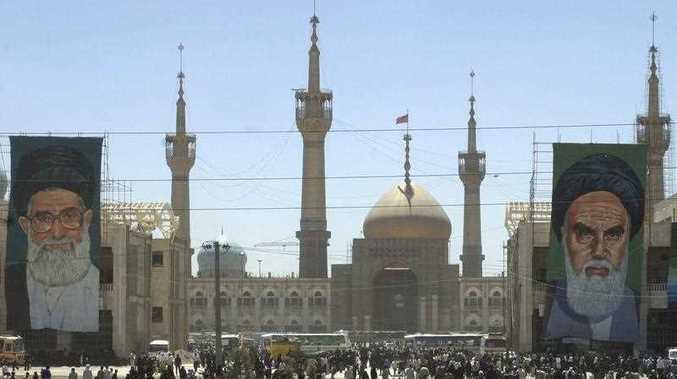 Fars reports a second suicide vest has been defused at the shrine. 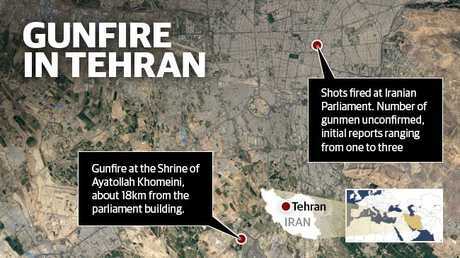 In addition to being lethal, the attack on the shrine of Khomeini is symbolically stunning. As Iran's first Supreme Leader, Khomeini is a towering figure in the country and was its revolutionary leader in the 1979 ouster of the shah. An Associated Press reporter saw security forces, some uniformed and others in plainclothes, around the large and ornate shrine located just outside the capital. The Fars news agency reports the director general of Iran's intelligence ministry and anti-terrorism operations unit as saying the members of a third terrorist team had been arrested in Tehran before they had been able to launch their attack. Iran's relatively moderate government - led by Hassan Rouhani - took control after elections in 2013 with a clear majority. He embarked upon a diplomatic campaign to improve relations with the West, restarting international dialogue over his nation's nuclear weapons program. Fresh elections were held in May, and Rouhani was elected to a second term amid allegations of foreign interference. But internal political divisions remain strong, with Iran's supreme leader Ayatollah Ali Khamenei opposing many of Rouhani's moderate policies. Relations with Iran recently sustained setbacks with US President Donald Trump adopting a hard line and abandoning negotiations.. The shootings comes amid renewed pressure on Iran's nuclear program and charges of backing international terror. Qatar, which follows the same Shia sect of Islam as Iran, this week became the focus of international sanctions for alleged financial support of terrorist organisations. Earlier this week, Iran's supreme leader Ayatollah Ali Khamenei said attacks by the Islamic State group in Europe and elsewhere show that Western policies in the Middle East have backfired. "Today, Daesh (Islamic State) is being pushed out from its birthplace in Iraq and Syria and is moving to other countries - Afghanistan, Pakistan and even the Philippines and European countries," Khamenei said in a televised speech.